This is not a marketing gimmick. For one, I have nothing to sell... not yet. This is something that two years ago I would not have thought possible. In the past I never quite finished my stories. And those that were almost there, really sucked. I got over that hump with Aces. But this type of productivity is not the norm for me. I wrote a 60,000-word romantic comedy in two weeks (ten actual days of writing). And I'm still having a hard time believing it. Back on August 25th, just before I drifted off to sleep, a seed sprouted in my brain--a story about forgiveness and closure. I dreamt about it and when I woke up the next day I had a surge of flammable adrenalin. The next day on the 26th, I wrote a blog about my new story. I flippantly said that I was having an affair. At that point in time, I was developing the idea. And as the parts of it came together, I started obsessing over it. The fact is that I was in love--and I mean that sincerely. I was in love with the idea. I was in love with the characters. I began to feel those butterflies and anticipation and longing that one feels when you fall in love. I could't stop thinking about the story. I wanted (needed) to know how things would come together. Would they come together? Is it possible to fix things that went wrong in the past? And when I get this way, my dreams are shattered. I've blogged about this as well. My world of dreams and reality get blurred. This is a curse, I admit. I was not able to sleep. I would work off the fumes of love and passion. As I developed the story, I used a tried and true system that has worked well for me in the past (James Scott Bell's framework for plot and structure). This time, I incorporated what I learned in his seminar which I attended in Los Angeles. By August 29th I was ready to start. I want to stress, that this is a very short, even by my impatient standards, period of planning time. But I had identified what I needed. I knew my main characters very well. Too well. I knew the conflict and the challenges. What I didn't know was how I would end it... but I never know that. To get into the right state of mind, I spent time flipping through old year books (oh yeah, I worked myself up). I reminisced, bringing back and tapping into those awkward days. I read the notes that my friends wrote ("You're the best. KIT" -- "Lakers rule!"). Then I hit the mother load. I had forgotten that during 9th grade I kept a journal for about three months. As I read the horrible melodrama that was my life, I knew that I was ready to explode with content. But I did one more thing on the 29th. I analyzed one of my favorite romantic comedies -- Notting Hill. I even blogged about it for you. My new story is a romantic comedy so I wanted to assure that I had not left any page unturned. I bagan to write in earnest on August 30th. I wrote the first chapter and stopped there. I have this ceremonial thing that I write the first chapter and evaluate the voice, the dialogue and the characters. The next day I gave it to my wife. She smiled and said the thing every writer wants to hear. "I want to know what happens next." Nine days of writing and I was at 53k words. 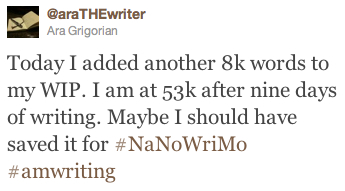 By the next day I was sitting at 60k words. Which happened to be the goal for this particular story. I wrote fast, because I honestly couldn't stop the process. I was scared that I would lose it if I didn't burn through it. Also, I needed to know how the story would end. I used all my tools that I've written about in the past. Scrivener, Evernote and the iPad. Not to mention Nutella (#nutellaWriters) and espresso. On Sept 9th, I was done. Over the past couple of days I've taken a break. 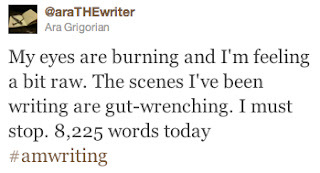 I have to tell you, writing like that has a burn out effect. I was (am) exhauseted. To keep up this clip I would wake up at 4 AM to write until 6 AM. Then from 7 PM until 1 or 2 AM. Now, I'm done. And a bit shell-shocked. Now I'm letting it simmer. I'm creating distance from the story. I will return to it in a month (maybe two weeks... maybe one). And I have to say, I'm dying to read it. I'm already considering a few additional scenes... but I must admit, maybe I wrote those scenes already. A dream, but a real dream. LOL! But I'm not attesting to the "quality" of them words :) Your words are better than my words. This is starting to feel like a kung-fu movie from the 80's! WOW! Congrats, Ara! 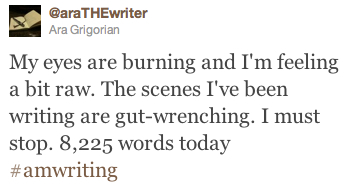 Sometimes you just have to go with your gut and just put those words on paper (read: scrivener/iPad/nutella/evernote). Congrats! I imagine the creative hangover must be quite intense. I think the most I've ever written in a day is about five thousand words, and after that, I couldn't tell the difference between reality and my own head anymore. It was AWESOME. Wow. FANTASTIC job! I think my record word count for a day is somewhere around 6-7k. But sustaining that for ten days...very impressive. Definitely let your story sit for a bit before you look at it--it'll help you have fresh eyes when you start editing (which, I imagine, will take more than ten days :D ). Great job and congratulations! That's certainly an accomplishment to be proud of.